SOPOT, POLAND — It was a rainy, windy, cold day in northern Poland, but our able leader Piotr Kuklinski organized an enjoyable educational field trip to the ancient city of Gdansk, once known primarily by its German name, Danzig. The old parts of the city are gorgeous, especially considering that about 90% of the city was destroyed in World War II. 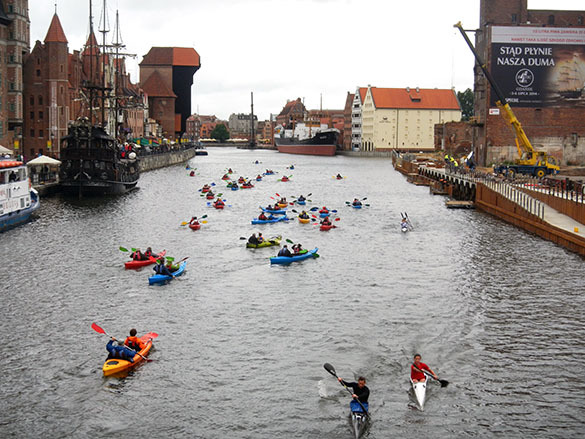 Above is a view north of the Vistula River filled with hardy kayakers. While delightful, the city, cathedral and town hall views will not surprise anyone who has visited the old cities of eastern Europe. For me the best parts of the visit were when we saw places significant for recent Polish and world history. 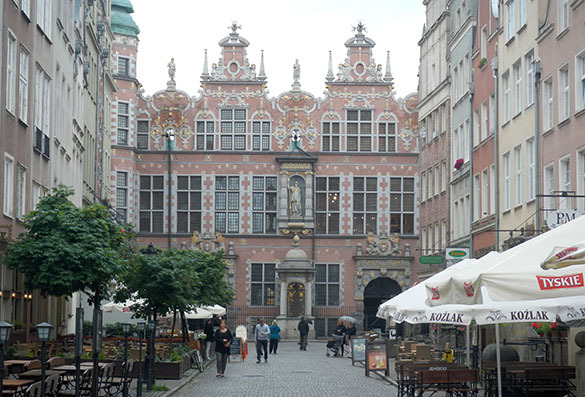 This 17th Century armory building is a good example of architecture in Gdansk at the height of its wealth and influence. It was built by Dutch engineers and builders using bricks brought as ship’s ballast from western Europe. 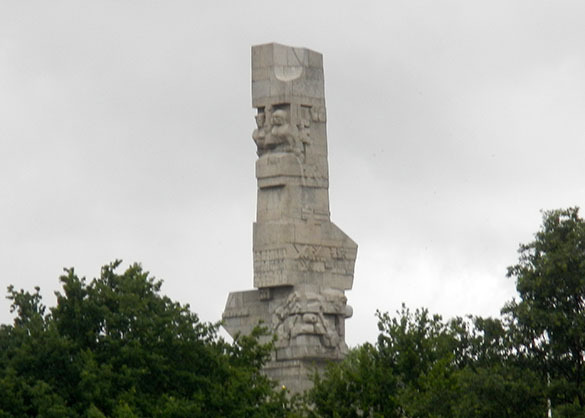 We took a boat ride into the freezing wind and rain to see the monuments of Westerplatte at the mouth of the Vistula. This is where World War II began when German ships fired without warning on Polish fortifications in the early morning of September 1, 1939. The Polish garrison surprised everyone, especially the Germans, by holding out for seven days under terrific fire and continuous attacks. Above is a Soviet-style marker of the main center of resistance to the invaders. I was moved by our visit to the “Roads to Freedom” underground exhibition. It represents the history of Poland’s post-war struggles to escape Communist oppression and Soviet imperialism. 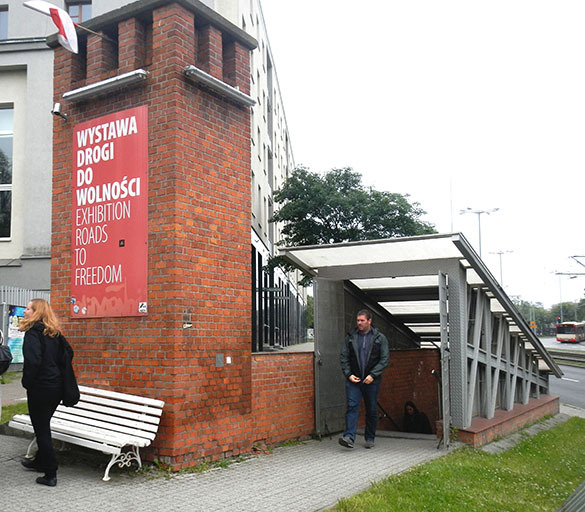 A major theme is that actions of the Polish people in the 1970s, 1980s and 1990s encouraged the rest of Europe’s captive states to seek their own freedom and independence. 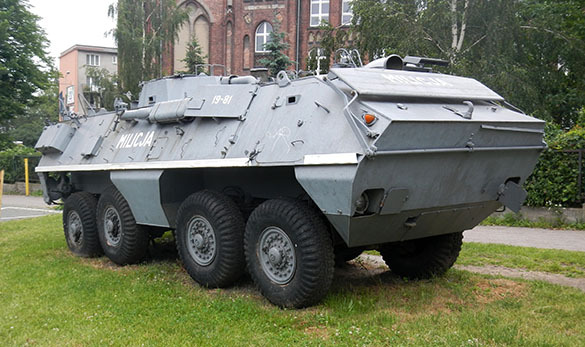 A Polish militia armored vehicle sits outside the exhibition entrance. This kind of vehicle figures often in the exhibition’s archival films of street violence in Gdansk and other large cities. The history of the Solidarity movement is one of the most dramatic stories of the late 20th Century. 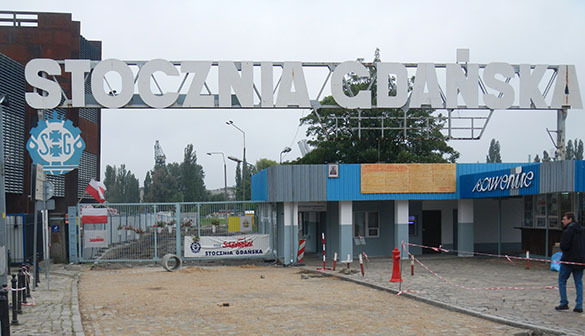 This is the most famous gate into the Gdansk Shipyards, where Lech Walesa led striking workers into what eventually became a national resistance movement. Now under the awning on the right is a 24-hour ATM! 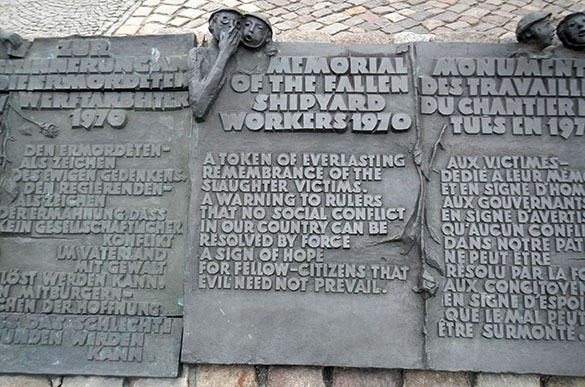 One of the demands of the striking workers is that they be allowed to construct a monument to their comrades who were killed in a previous strike in 1970. This is one of the plaques near the structure. 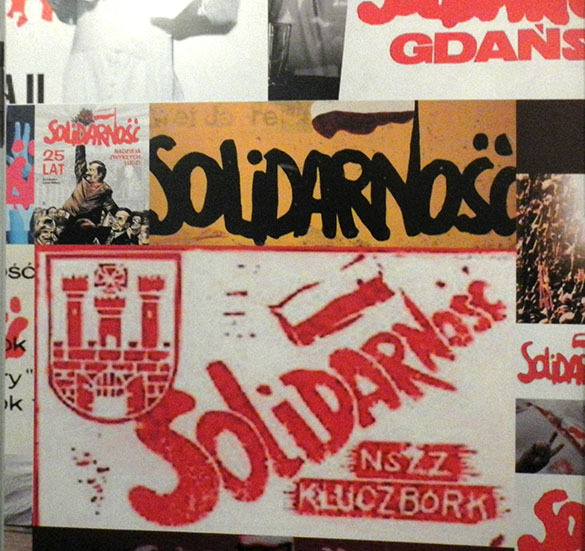 To show the global nature of the Polish political revolution, the exhibition organizers obtained a piece of the Berlin Wall to place outside the museum. Geologist for scale. (Thanks, Tomasz Borszcz, for the photo.) 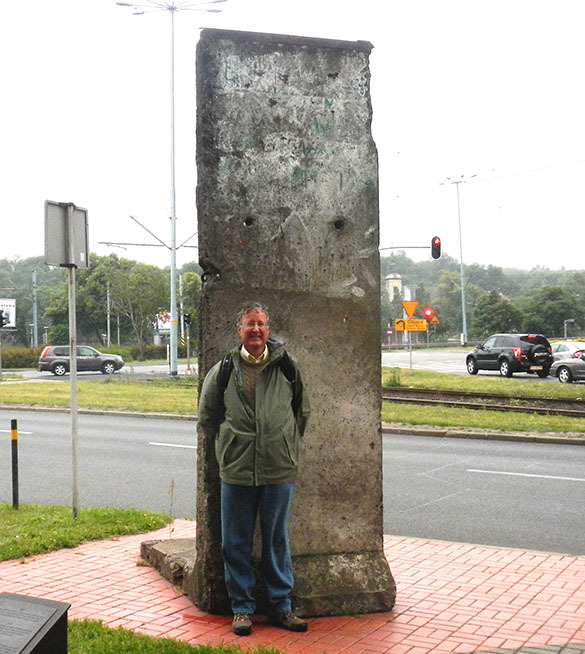 I remember the dramatic events televised from Gdansk and would have never dreamed in, say, 1983 that I would someday stand by a piece of a dismantled East German wall in the free city of Gdansk.